The membranes around your spinal cord and brain are called meninges, and when they become inflamed, the condition is known as meningitis. It is usually caused by a viral infection, but fungal and bacterial infections may also lead to meningitis. Depending on the underlying cause, it gets better in a couple of weeks. In some rare cases, it produces life-threatening consequences requiring urgent antibiotic treatment. If you or someone in your family exhibit meningitis symptoms, it is essential to seek immediate medical care to prevent serious complications. You may develop meningitis due to viral or bacterial infections. Symptoms appear quickly when you have viral meningitis, but they may take some days to develop in case of bacterial meningitis. The early signs and symptoms resemble a lot to the flu, so it is quite natural to not take them seriously. The most common symptoms include stiff neck, sudden high fever, seizures, confusion, vomiting or nausea, sleeping difficulties, lack of appetite, and skin rash in some cases. It is important to note that symptoms may vary a bit depending on your age. For instance, infants and newborns are more likely to have headaches with stiff neck. Other signs are high fever, poor feeding, constant crying, excessive irritability, sluggishness, stiffness in the body, and a bulge on top of your baby's head. Your baby may also breathe rapidly, become drowsy, and have pale, blotchy skin. Symptoms of meningitis in teenagers and adults may be a bit different. While they also experience symptoms, such as confusion, drowsiness, vomiting, high fever, and a severe headache, they are more likely to develop sensitivity to light, a distinctive rash, and convulsion or seizure. Bacterial meningitis may have several complications, including visual impairment, hearing loss, learning disabilities, and seizures. It may also affect the kidneys, heart, and adrenal glands. Complications of bacterial meningitis usually need additional treatment. Your doctor may prescribe anticonvulsants to treat seizures or give IV fluids and certain medications if you develop low blood pressure. Some children may require supplemental oxygen to deal with breathing problems. Do You Have Viral Meningitis or Bacterial Meningitis? 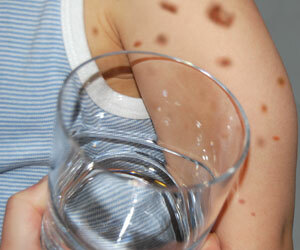 Unfortunately, it is not possible to differentiate between the two just by having a look at symptoms of meningitis. Your doctor will perform several tests to tell the difference between the two types of meningitis. That is the reason why it is important to treat every case of meningitis with equal care. Take a clear glass and place it against your skin. Apply some pressure and see if the rash fades or not. If it does not, it may be meningococcal septicemia. Your rash will also look like tiny pin pricks and may later turn into purple bruising. If you notice these signs, you should seek immediate medical help. They ask for blood tests to identify the bacteria that is causing the infection. They may ask for imaging tests, such as X-rays and CT scans of your chest, head, or sinuses to see how severe the inflammation or swelling is. These imaging tests also help determine if other areas of the body are infected or not. They may ask for spinal tap that involves taking out some cerebrospinal fluid (CSF) for analysis. If it shows a low sugar level with increased white blood cells, the chances are you have meningitis. Once your tests and symptoms of meningitis confirm that you have this infection, your doctor will work closely with you and determine the best treatment option. It usually depends on what type of meningitis you or your child has. 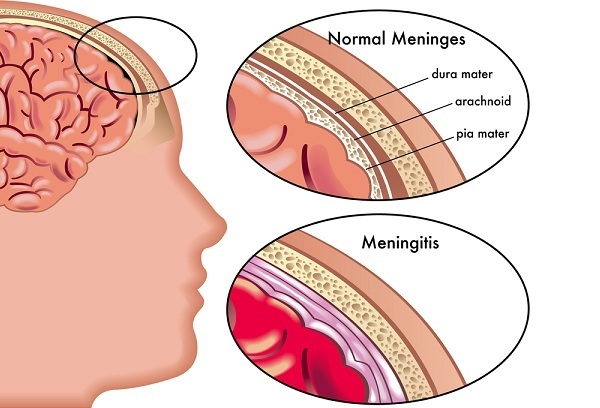 Bacterial Meningitis: It requires treatment with intravenous antibiotics as well as cortisone medications to reduce the risk of complications, such as seizures and brain swelling. Your doctor may prescribe a broad-spectrum antibiotic if the exact cause of meningitis is not clear. Viral Meningitis: You usually need no treatment because antibiotics are ineffective against viral infections. It may take several weeks until you notice some improvement. You need to take plenty of rest with fluids and some OTC medications to relieve body aches and pain. Your doctor may prescribe an antiviral medication if your meningitis is due to a herpes virus. Other Types of Meningitis: Your doctor will start antibiotic and antiviral treatment if the cause is not yet clear. Using antiviral medications when the cause is not known is not a good idea because they can have serious side effects. Cortisone medications are effective for noninfectious meningitis caused by an autoimmune disease or allergy. Viral Meningitis: No treatment is usually necessary because your child's immune system will handle it on its own. Sometimes, it is important to give your infant medicine for fever and pain relief. Bacterial Meningitis: You will have to give your child some antibiotics to eliminate the bacteria. In most cases, it requires a hospital stay of up to two weeks. The treatment helps 85% of the time, if it is diagnosed early. Routine immunization really helps a lot in preventing meningitis. The vaccines against measles, Hib, polio, mumps, pneumococcus, and meningococcus help protect your child from meningitis. It is important to vaccinate your child for meningococcal disease once they turn 11 – they should get a booster shot when they turn 16. Moreover, good hygiene will also protect you and your child against meningitis because many viruses and bacteria that cause this condition are quite common. Tell your kids to wash their hands before they eat anything and especially after using the bathroom. Also, avoid sharing utensils with someone who is ill.